This serene scene is from a past Veterinarians of Tomorrow dog walk. 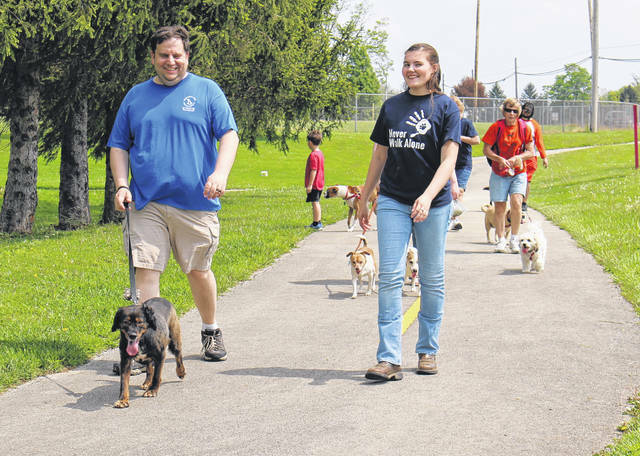 WILMINGTON — Wilmington College’s Veterinarians of Tomorrow will host its 14th Annual Dog Walk on Saturday, April 27 to benefit animals in need helped by the Wilmington Area Humane Society (WAHS). Registration will take place at the J.W. Denver Williams Jr. Memorial Park pavilion B in Wilmington from 1:-2 p.m. with the dog walk at 2 p.m. The pre-registration fee is $12 per owner/dog team; on-site registration is $15 per owner/dog team. To pre-register or for questions, email Teiara.j.saling@wilmington.edu. If pre-registering, please include your name, dog’s name, breed, if up to date with vaccinations and whether your pet has any aggressive behavior around other dogs no later than April 22. The length of the walk is approximately 2.6 miles and the course will follow the 4-C Bicentennial Trail. There also will be a short course, approximately 1.3 miles, for older dogs that owners would like to have participate. Anyone who doesn’t have a dog but would like to participate and help the Wilmington Area Humane Society is more than welcome to attend and participate in the walk. The Dog Walk will be held rain or shine. Representatives from the Wilmington Area Humane Society will be in attendance. There will be gift bags and a raffle. The College Veterinarians of Tomorrow is a Wilmington College organization for students who hope to work with animals in the future. The organization is led by Teiara Saling as President. Other officers include Jade Neagle, Vice President, Lindsay Clement, Secretary, Sarah Gigandot, Treasurer, Maya Yerian, Public Relations and the advisor is Professor Harold Thirey.